andy Hearts and Paper Flowers was born a year ago today when I started sharing entertaining, organizing, cleaning, cooking, quotes and other things I love. I've always considered this more of a Homemaking blog, trying to share all the tips, advice and things that I love that relate to taking care of yourself, your family and your home. I have been blogging for a very long time on various platforms, mostly as a way to keep up with friends and sharing random personal bits, but updating very infrequently. About a year ago I was talking with my mom and mentioned that I'd like to write more, but it's hard when there is no focus to my blogs at all. Most things I wouldn't share to protect other people's privacy anyway. So, Candy Hearts and Paper Flowers was born. In the past year I've had just shy of 10,000 unique visitors and many of you visit everyday or fairly often. I just want to say thank you, from the bottom of my heart, thank you. I've made some amazing friends through this blog and hope to continue to meet new people and get to know everyone who visits. Since I love you all so much, I'm going to giveaway a little gift package which will include a copy of my favorite reference book for making your house a home, some easter goodies and a few other little things. It was a bit of the inspiration for this blog's topic and the first quote I shared was taken from it, so I feel it's apropos. "I am a working woman with a secret life: I keep house." 1) What would you like to see more of on Candy Hearts and Paper Flowers? 2) What's your favorite previous post on Candy Hearts and Paper Flowers? Also, if you don't have a blog, please make sure you leave me a way to get a hold of you! The winner will be picked by my hubby randomly, might see if we can get Zaya to pick. I will announce the winner at 6pm on April 3rd and announce it here on the blog and try to contact you via your blog or email, if I don't hear back within a week, I'll pick a new winner. Someone is getting this book, it's on it's way from Amazon and I already have a copy! Want an extra entry? Subscribe to my RSS feed in a feed reader or via email and add an extra comment letting me know you do so, make sure you tell me if you are already a subscriber! Want another entry? Tweet or post on your blog about this giveaway and I'll give you another entry, just add another comment here letting me know you spread the word and a link to where you posted it. Easy Peasy, right? Happy Blogiversary to you, happy blogiversary to you, happy blogiversary dear Barbara, Happy blogiversary to you, you domestic goddess! 2) definitely the series of posts you ran for September Shape-Up. Thank you for asking me to guest post. It was so much fun and so informative. 3)LMAO since you know my blog as well as your own!! Without this blog, I might never have met you! Thank you! I just stumbled upon your blog and am having such a great time reading over your past posts. What a lovely blog you have. 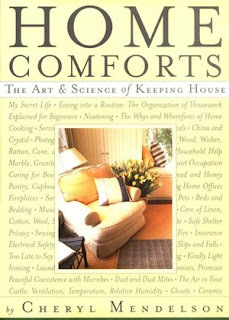 I have referenced the Art of Keeping House book over the years from the library but have never purchased it. What an amazing reference it is. I really like the way Cheryl Mendelson researched EVERYTHING. Very type A, just my style! 1. I'd like to see more tips on organizing. I truly want a place for everything--and everything in it's place! 2. I really like your Managing Paper post. I seem to fight with paper clutter more than anything. I just need to throw it all away! Please come by for a visit. I hope you enjoy it! Thanks again for such an informative blog! Oh Barbara, Happy Blogoversary friend! Gosh, mentioning Widman's reminded me of the lovely goodie box you sent the boys and I. It was so thoughtful - and uh, YUMMY. Thanks again.